Middle Child Syndrome occurs when there are three children in a family. The birth order is hugely influential on the personality of a child; research has shown that most of the U.S. Presidents were either the first-born or first-born son in a family, as were all but 2 of the first astronauts that were sent into space. This may have something to do with the fact that the first-born is always the most anticipated birth, and there is nothing to distract the parents so they get all the time and attention of their parents. Once more children join the family, the whole dynamic changes; the older child may not receive as much attention, or they may have to look after younger siblings when old enough. As parents have more children they relax more and become less demanding. Firstborns are generally more driven than younger siblings, whilst the middle child is far more likely to just coast along as they do not feel able to compete with their elder sibling and get tired of living in their shadow. 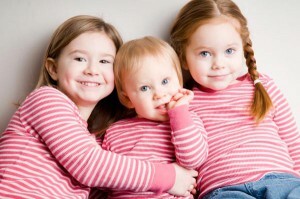 The youngest generally tends to be the most affectionate and more advanced than peers who do not have older siblings. As much as parents set out to love and treat all of their children equally, it can happen that the first-born is placed on a pedestal, whilst the youngest, being the “baby” in the family, generally gets away with just about anything. Middle-child syndrome occurs because the middle or second-born often feels as though they are invisible and need to do so much more to get any attention. Parents and grandparents make a huge fuss of all the firsts of a first-born, such as learning to walk, the first tooth, learning how to tie their own laces or ride a bike. By the time the next siblings come along all these things are expected so there is not so much of a fuss made. Being stuck in the middle is not the ideal position for any child, as they may feel that they do not fit in with the other siblings. Although parents may make a concerted effort to treat all of their offspring the same, parents are not the only contributory factor to a child’s growth. Children spend, on average, 33% of their free time in the company of their siblings, which means that they contribute hugely to self-esteem, ambition and personality traits. Middle children often feel that they have to fight to receive attention from parents and even other family members, and often feel as though they are being ignored. This feeling could be enhanced by the parents without them realizing it. They could feel that the older child needs help with homework because they are in a higher grade and the work is more difficult, and the youngest is still a baby (no matter how old they are), also needing more help. In this scenario the middle child is largely ignored and left to fend for themselves, reinforcing their feelings of being invisible and unwanted. A middle child may feel less of a sense of belonging than other children in the family. They usually feel that they have no rightful place and do not fit into the family dynamics. They feel unwanted or ignore and as such will struggle to feel that closeness they perceive the others to have. They somehow feel that they are merely the filling in a sandwich, with the older and younger siblings being the bread. The fact that a middle child feels that they are invisible and basically unwanted could lead to them developing low self-esteem, which will have a negative effect and could seriously impact the overall development of the child. A lack of self-esteem creates a lack of confidence, and sometimes makes the child feel as though every problem that happens in the family is their fault. Low self-esteem can lead to experimentation in drugs, alcohol abuse and other dangerous behaviors such as early sexual experimentation. If a child suffering from middle child syndrome gets in with the wrong crowd they will do anything to get accepted and feel part of the group to make up for not feeling part of the family at home. A lack of self-esteem is very often carried over to adulthood if not recognized and dealt with in a positive manner, and could lead to a life of crime as the adult may just continue the bad behavior learned in childhood as a means of attracting attention. Feelings of being unloved and ignored may cause the middle child to develop trust issues. We learn trust as children by learning to trust and rely on our parents, but this may not occur in a middle child. Children with middle child syndrome find it very difficult to confide in anyone about their feelings, and this could lead to them becoming negative with no sense of direction and no ambition. This could create problems wherein the child may develop a distrusting attitude and difficulty in opening up to others, which could lead to them becoming reclusive. Middle children may also become very cynical. The child suffering from middle child syndrome often exhibits little sense of direction due to the fact that they are disillusioned and feel as though they are not good enough. They have never been able to forge ahead and do something for the first time to impress their parents, because the eldest sibling has probably done it already. Children suffering from middle child syndrome are generally not extroverted and will therefore far more likely tend to be reclusive than social. They will become loners and may often prefer to be alone and live in a fantasy world that they create for themselves where they do not need anyone to lean on. This could lead to problems later in life, including the inability to form meaningful and lasting relationships. The middle child never had the benefit of having his or her parents to him or herself even for just a little while like the firstborn did, and if another sibling comes along that demands the parents’ attention the middle child will start acting out. Children suffering from middle-child syndrome can tend to become very cloying as they seek the attention and love that they are missing. If they do not get the attention they require they may act this out by exhibiting negative behavior as they may feel that is the only way to get attention from their parents or other adults, and perhaps even their peers. Many middle children therefore tend to exhibit behavioral issues such as temper tantrums, acting out, faking illness or various other ways geared to get attention on themselves. Middle child syndrome can have some positive effects too, and one of them is that the middle child often becomes the peacemaker in the family, especially between siblings. They also tend to be good negotiators, as they have to work for what they need, so they learn the art of negotiating at a young age. Both of the above advantages can be of great use to the adult middle child as these traits could help them in their social as well as their business lives. Having a third child means that parents need to change their parenting style somewhat to suit the new dynamics. When the ratio is two parents to one child it is easy as you can take turns and having two children means that in addition to taking turns you can deal with the offspring one-on-one. Once the family expands to three children though, the parent/children and the sibling/sibling dynamic changes dramatically. With three children there is no longer one parent per child and your parenting style needs to change from one-on-one to more of a zone defense. The logistics get more complex, you will need to double up and everyone will just have to make do with less individual time – this is not easy! Suddenly you have one child who is old enough to have attained a certain level of independence and seeking adventure which may not always be that safe, and another who will be demanding all of your time with feeding, changing, etc. This can create absolute chaos if you are not careful, and this is also exactly when the middle child slips through the cracks and develops middle child syndrome as they become rather invisible. Dividing your time – with three children there are going to be times when the triangulation between them changes back and forth and two of them will become closer and possibly even gang up on the other one. As their allegiances switch, use this as the perfect time to give some attention the whichever one is the odd man out at the time and do something special with them, such as going for a walk, a bike ride, to a movie or out for an ice-cream. As the allegiances change often you will get an opportunity to do this with all of the children individually over time. Do not play favorites – This is something that always comes up when there is more than one child in a family, and perceptions of favoritism could create many problems, including middle child syndrome. Although it is inevitable that each parent feels more drawn to the child that has more of their personality traits because they can empathize with them, this must never be seen to be so. It is important that you bring out the best in each of your children and celebrate each child’s good points equally so that none of them perceive favoritism. Sibling rivalry – Sibling rivalry is unavoidable, inevitable and only going to get worse as the children grow older and the family expands. As much as we would like it if all our children just go along well all of the time, this is not feasible, but there are ways to handle this without causing more problems. The key to handling sibling rivalry is to remain neutral and not constantly play referee. Let the children sort it out themselves as long as there is no violence involved and nobody gets hurt. Make a family rule that they sort it out themselves and that tattling will not be indulged. If things get hectic send both or all of them to their rooms to relax and calm down. Never compare children – in order to avoid sibling rivalry or feelings of inadequacy, middle child syndrome or jealousy. Treat all of your children the same and never compare the accomplishments of one sibling to those of another. Saying something like “Why can’t you be more like your brother” could trigger feelings of ineptitude and being unloved, especially in a middle child who probably feels that way a lot of the time anyway. Enroll them in different activities– so that they can each shine in their own strengths and not try to compete with each other. This will also give them the opportunity to make friends apart from each other, and give them the opportunity to socialize and to compete with peers and not younger or older siblings. Praise them for their individual triumphs and encourage them to support, help and cheer for each other. One must bear in mind that not all middle children suffer from middle child syndrome. 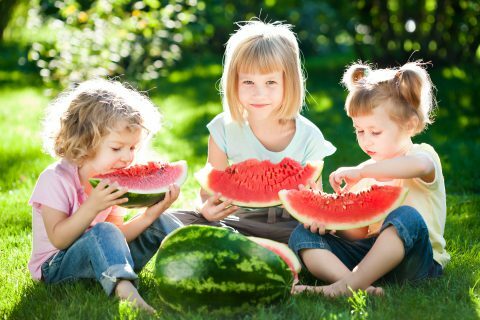 Many middle children grow up to be very balanced and mature adults who are laid back, independent, socially adept and are very good at taking care of their own needs. Previous Previous post: How Do I Help My Child With Nightmares?